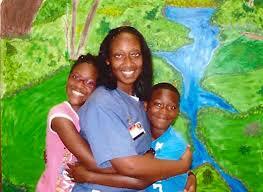 Home › Uncategorized › DROP THE CASE: FREE MARISSA ALEXANDER! Marissa Alexander, the African American mother from Florida serving a 20-year sentence for self-defense, will have a status hearing on Thursday, October 31 at 9am. The hearing will indicate whether State Prosecutor Angela Corey will go ahead with a new trial or will drop the case entirely, as Alexander’s supporters hope. Alexander was sentenced to 20 years in prison for firing a warning shot to stop an attack by her abusive husband. Her case has frequently been compared to that of George Zimmerman, who was found not guilty on grounds of self-defense for the killing of Trayvon Martin, while Alexander was denied Stand Your Ground protection and sentenced to 20 years although no one was injured by her action. She has already spent more than two years in prison. At the end of September, a Florida Appeals Court overturned Alexander’s guilty verdict due to fundamental errors by the prosecution. The hearing will be at 9am at the Duval County Courthouse, Rm 608, 6th Floor, 501 W Adams St, Jacksonville. The Free Marissa Now campaign, which has built an international support movement for Ms. Alexander, is holding a press conference at 7am outside the courthouse and will issue a statement to the press after the hearing. July 15, 2013 -The political climate created by the George Zimmerman trial has shed light on the opaque imaginations of what some think is a post-racial nation. We are heartbroken for Trayvon Martin’s family, who have demonstrated brave resolve throughout this ordeal and we hold them in our thoughts as we move forward. We send strength to the family of Jordan Davis, another unarmed Black male Florida teen murdered by a white male who claimed Stand Your Ground, and many others who are gearing up for their journey through these same halls of due process. 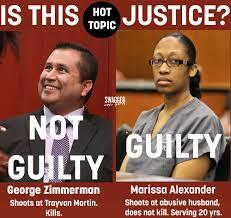 As long as the Florida justice system has a double standard. The Free Marissa Now Campaign is organizing to win freedom for Marissa Alexander, a proud African American mother of three with an MBA and a survivor of domestic violence. In August 2010, Marissa fired a single warning shot in the ceiling to halt her abusive partner during a life-threatening beating in her home. Marissa’s husband, who has previously landed Marissa in the hospital after beating her, admitted in a sworn statement that he was the aggressor, threatened her life and was so enraged that he did not know what he would do. Despite the fact that Marissa caused no injuries and has no previous criminal record, and despite the fact that Florida’s self-defense law includes the right to Stand Your Ground, she was arrested by Jacksonville police, charged with aggravated assault, and sentenced to twenty years in the Florida criminal correctional system. We must take a stand against the criminalization of all survivors of domestic and sexual violence. Marissa’s case is one of many that shows us how Black women and other marginalized people are especially likely to be criminalized, prosecuted, and incarcerated while trying to navigate and survive the conditions of violence in their lives. Freeing Marissa is a social justice action against intimate partner and systemic violence against all women, and an urgent call for the end of mass incarceration and support for truly transformative solutions to violence.